It is the time of year to spend more time outside instead of in the kitchen and quick delicious meals are a particular goal of mine. To that end I begin with a Curtis Stone recipe since the cooking club picked him as a new featured chef and I look forward to the opportunity to peruse and try several new to me dishes. A relatively quick adaptable perky version of shrimp tacos with a creamy avocado purée adapted slightly with Hatch Valley salsa (TJ’s) instead of jalapeño peppers and easily prepared in a blender or stick blender jar, refrigerate until ready to serve. The shrimp only marinates for 5 or less minutes and seared for 2-3 minutes in a very hot grill, it wasn’t worth heating up the grill for such a quick meal. Easily halved for a few or increase for a casual party, serve with Lefty Doul’s Margaritas, a big bowl of salsa, warm corn tortillas and lots of napkins. Consider sides of your favorite taco garnishes as well, a great shredded slaw would be fantastic. 5. 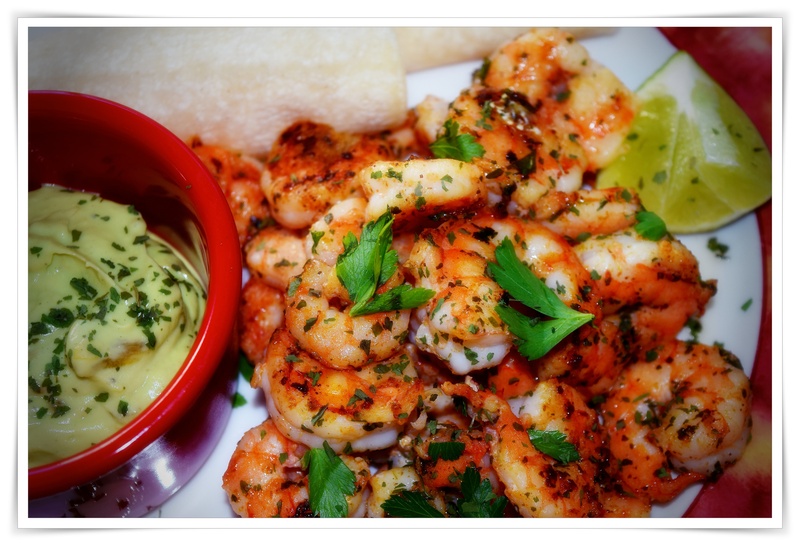 Remove the cooked shrimp from the grill and place on a serving platter, with a serving bowl of the avocado purée. Garnish the shrimp with fresh sprigs of cilantro and serve.